Prior to the days of high-tech spa treatments, wellness seekers headed to the hot springs. On your trip to Machu Picchu in Peru, you can take some time to take a hot bath, in an impressive environment of abundant vegetation next to a huge river; The place looks like a fantasy, but you can buy beers and snacks. Hot springs are Mother Nature’s method for infusing relaxation into tired bodies. The hot springs of Colcalmayo are a popular destination among travelers seeking a connection to land and its balance. There is nothing better than taking a hot bath in nature, while enjoying a drink of aguaymanto. Taking a swim in the Hot Springs of Cocalmayo is a great experience. It is situated between a huge river and a small mountain. 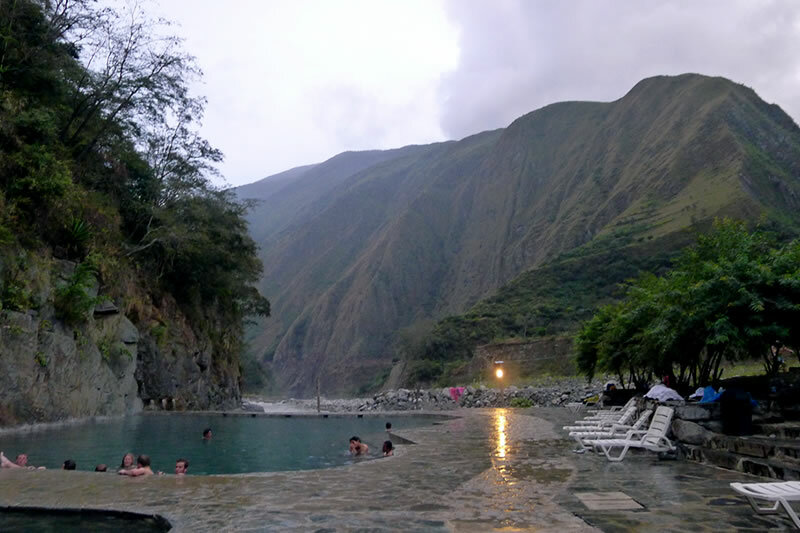 In Cocalmayo bathers can enjoy outdoor pools fed by natural hot springs, built between a small mountain full of vegetation and the Urubamba River. You will find 3 pools of different sizes and depths. The water temperature varies between 38 and 44 ºC and unlike most hot springs in Peru, it has clear water. Very close to the pools there are cold showers, the water comes from the lagoons of Uripata and is very refreshing; The water mixture will give you a very comforting feeling. Benefits: Located at 1,600 meters above sea level, its waters are rich in essential minerals such as sodium, magnesium, bicarbonate, calcium, sulfate and others, which have healing properties in the skin, bones, muscles and joints. Where are the thermal baths of Cocalmayo? How much does the Ticket to the Hot Springs of Cocalmayo cost? No matter which route you take; By train, by bus or by walking, before or after visiting Machu Picchu, the tour will be exciting. We recommend relaxing in the pools before returning to your daily routine. Take a bus from the city of Cusco to Quillabamba and get off at Poblado de Santa Maria, the trip lasts approximately 5 hours and is 221 km per paved road. Santa Maria is at 1280 meters above sea level, the climate is warm. The next destination is Santa Teresa, which is located 25 km from Santa Maria. From here you must take another vehicle to travel for 1 hour until you reach Santa Teresa. If you already take your train from Ollantaytambo and you are on your way to Machu Picchu, you can take the train and get off at the “hydroelectric” whereabouts, from here you can take a vehicle, which will take you in 20 minutes to Santa Teresa, or if you wish Walk, it will take you 2 to 3 hours to reach Santa Teresa. If you do not know how to get to Ollantaytambo, enter here. After having visited Machu Picchu or if you have time before entering it, then you are very likely to want to know these baths. Make plans to visit the thermal baths of Cocalmayo, it is a relaxing, unique and memorable experience, and unlike the hot springs of Aguas Calientes, it has clearer and hotter waters. There are two ways to get to the hot springs of Cocalmayo from Aguas Calientes (Machu Picchu Pueblo). If time permits, you can walk from Aguas Calientes (Machu Picchu village). First you must go to “Hidroelectrica”, this will take between 2 and 3 hours, through tunnels, bridges and the beautiful jungle landscape of the valley, following the train tracks. Once in Hidroeléctrica, walk for an hour and a half more to the town of Santa Teresa. The train tracks after leaving Aguas Calientes, arrive until “Hidroeléctrica”; The trip will take about 20 minutes and cost S/. 5.00 for national and USD $ 8.00 for foreigners, are 6 km of beautiful jungle landscapes. From here you can continue to Santa Teresa by car or on foot. By car: The baths are located 4 km from the city of Santa Teresa, collective cars depart every 20 minutes, from the Plaza de armas de Santa Teresa and take you in 10 minutes to Cocalmayo. Walking: You can also walk from Santa Teresa to the baths of Cocalmayo, it will take you around 30 minutes following the road. On the way you will see the people who arrive after crossing the Inca Jungle Trail to Machu Picchu. Hours of operation: Bathrooms are serviced every day of the week from 5:00 am to 11:00 pm.